Lumba is Traditional Indian jewellery which goes on upper arms. its long hanging decorated with colorful threads and beautiful beads and stones. its have 3-6 strings tied in designer way. You can tie the lumba on your upper arms and let the hang on. when u move your arms its spread beautiful. 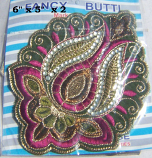 its mostly worn on wedding and festivals of indian with colorful clothing and costumes. but its also important jewellery for transnational jewellery. if you performing Indian dance or bollywood dance. you sure need pair of lumba for make yourself more Indian dance performer. Its mostly comes with Red or green threads but some time its available in other colors. so please suggest your costume color so we will find best available for you and sent you pictures before we ship to you..